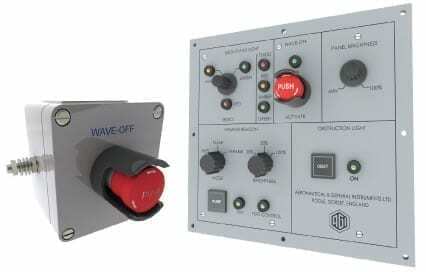 Bridge Control Panels can be provided to operate Deck Status or Pilot Information Light, and Wave Off activation switch. Other control functions for the Homing Beacon and Obstruction/Obstacle Lighting can be added if required. Console mounted Bridge Panel incorporating red and green Deck Status, or red, amber, green Pilot Information Light and Wave Off activation switch. Other control functions for the Homing Beacon and Obstruction/Obstacle Lighting can be added if required.